Although there are rumours of a takeover being close, we’ve been here before and yet the club is still in the Allams’ hands. So we’ll continue to protest against the way they’re running the club at this Saturday’s match against Leicester. See the bottom of this page for a timeline of protest activities. We’ve received plenty of suggestions from fans for various protest ideas. Some of these suggestions have involved walkouts or late walk-ins, or even disrupting the game. We’re not encouraging anything along those lines at this stage. The important thing for us is that the protests are well organised and observed by the majority. The worst case scenario is that different groups of fans try to carry out different protests and none of them really work as a result of the diluted efforts. It may be that in the near future, if the current farce at the club continues and the club is not sold, we have to step it up again and maybe then would be the time to consider more active protests. The aim of what we’re encouraging now is to highlight for the TV cameras how upset City fans are, and bring attention to the various issues we have with the Allams’ ownership of the club, such as the detestable pricing out of children, seniors and the disabled from attending matches, forced seat moves and the ongoing obsession at the club with eradicating any reference to the word ‘City’. A lot of neutrals still don’t understand what is going on at Hull City. We want to make sure that they can start to understand after seeing this match on TV, we want to make the pundits discuss the situation and we want to bring attention to the shocking mismanagement of the club by the Allams. To this end, we’re proposing a large and widespread visual and vocal demonstration. This means red cards again, but also banners and plenty of singing. We’re asking fans to hold up a red card as the teams emerge before kickoff and make yourself heard vocally. If you have a banner (it must be smaller than 6 feet by 4 feet and be certified as fire safe, or the club could refuse its entry on the grounds of safety), bring that along and hold it up at this point too. We’ve commissioned several banners to help make our point but it’s definitely ‘the more the merrier’ so if you’ve got one bring it, and if not, consider making one. When the match reaches 19 minutes and 4 seconds in, we’ll do it again. This of course is the time at which fans have protested against attempts to change the club’s name by singing ‘City Til I Die’, in reference to the club being founded in 1904. Get those cards and banners up and sing loud. Make sure the cameras see and hear how unhappy we are. For the rest of the game, we’re asking fans to just sing loud and proud as normal. Keep those banners up if you like, but the main thing is that we make a noise. The players are certainly going to need that backing. Some people think that protesting means not giving the lads our support, so let’s show them that’s not the case. 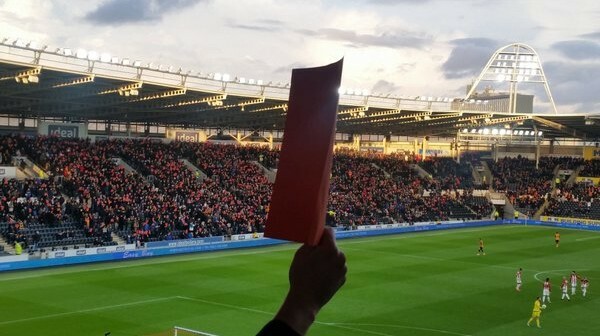 We’ll be distributing red cards from various entry points to the stadium area, as well as from our base at the William Gemmell pub on Anlaby Road. Cards will also be available to collect from the Tigers Lair pub, where a separate group of supporters are meeting ahead of a protest march to the stadium, and also from the Circle 87 cafe, partners of HCST and located opposite the stadium on Anlaby Road. We’d appreciate any help distributing the cards, so if you’d like to help, meet us at the William Gemmell pub at 10:30am. Here we’ll be co-ordinating the distribution of cards to ensure that they’re easily available for fans arriving at the ground. The bar will be open here and the nearby Circle 87 Cafe will be selling food. In addition to these demonstrations inside the ground, there are also thousands who no longer attend home matches while the Allams own the club, and many have told us that they want to be involved but won’t be entering the stadium. So as not to exclude these people, there will also be a demonstration outside the West stand reception at 12 o’clock noon. Everyone is welcome to join this. We understand that there will be media on the scene so this is another great chance to make ourselves heard. The ‘Allam Out Protest March’, which has been organised separately from HCST, will culminate here so that fans can join this demonstration together. 10:30 – Meet at the William Gemmell pub if you’d like to help with protests. Also at this time, the ‘Allam Out Protest March’ meet at Tigers Lair. 12:00pm – Demonstration outside the West stand reception including fans who are not attending the game. 12:25pm – Teams come out for kickoff. Hold up your red cards and banners and make yourself heard vocally. 12:30pm – Kickoff. Make as much noise as you can, as normal. 19 minutes and 4 seconds into the match – Hold up your cards and banners again, sing ‘City Til I Die’ and anything else you can think of to make yourself heard. Rest of match – Make as much noise as you can, as normal.